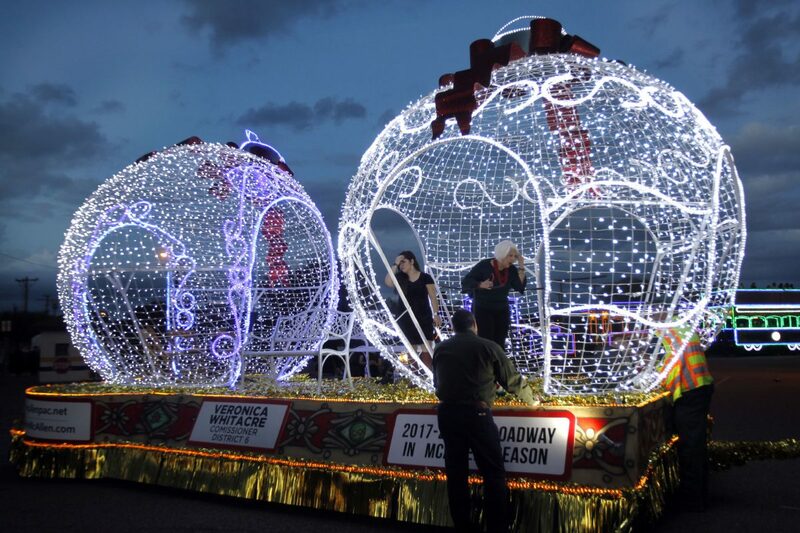 McAllen city commissioner Veronica Whitacre on her float at the McAllen Holiday Parade at McAllen Veterans Memorial Stadium on Saturday Dec.2,2017, in McAllen. McALLEN — Despite budgeting $690,000, the city made $415,833 in sponsorships for the annual holiday parade in December 2017. The city also budgeted $60,000 for ticket sales but took in $53,625. City officials said 40,000 people attended the two-day event. Many couldn’t attend but watched on television in places such as Laredo, Corpus Christi, San Antonio, as well as Mexican cities, Monterrey and Saltillo, according to a city report. Multiple Dallas Cowboys players, current and former, were special guests for the parade. The University of Texas Rio Grande Valley found that 89 percent of people who were polled in a survey were drawn to the parade because of the Cowboys and various celebrities on hand. The study also concluded that $9.4 million was injected into the local economy from the parade. In addition, the total economic impact on the region’s businesses and government resulting from the parade was $14.1 million. A total of 167 jobs were supported and compensation for employees totaled $3.9 million. A total of $911,360 in taxes resulted from the parade activities.